Moroccan Foreign Minister Nasser Bourita on Tuesday (July 4) in Addis Ababa expressed Morocco’s satisfaction at the decisions taken on the Sahara at the 29th Summit of Heads of State and Government of the African Union (EU). “Morocco is very pleased with the debates and decisions that have been taken place at this session,” Nasser Bourita told a press conference after the summit, saying that “maneuvers and procrastination (by Morocco’s opponents) have been discarded. Today, we have positions that go in the right direction”. The head of Moroccan diplomacy also welcomed the wording of the resolution on the Sahara in which African Heads of state call for “appropriate support” for the UN Secretary-General to resolve the Sahara dispute. The resolution, he said, is “very important and is an evolution”, since it “recognizes the leadership of the United Nations and the handling of the issue in New York”. Actually, contrary to the South African Nkosazana Dlamini-Zuma who was completely aligned with the Algerian position in the Sahara issue and openly displayed her hostility to Morocco, the new chairman of the AU Commission, Chadian Moussa Faki Mahamat, adopted a more balanced tone in addressing this issue. 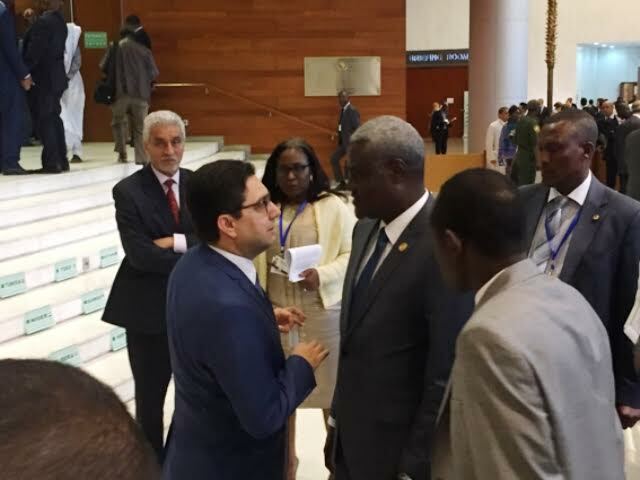 Faki Mahamat affirmed to have taken note of the solid arguments of Morocco and of its serious and credible efforts, acknowledged by the international community, to settle definitively this issue. He also welcomed the calming down of tension in the Guerguerat area and welcomed the intention of the new representative of the UN Secretary General, German Horst Köhler, to launch a new initiative to find a peaceful solution to the conflict. Moreover, after it had been manipulated for a long time to side with the separatist theses of the Polisario and the geostrategic interests of the Algerian regime, in collusion with South Africa, the AU commission broke with this alignment and pronounced itself for a “consensual” solution to the artificial Western Sahara conflict. Morocco also succeeded to have the AU Executive Council delete the words “occupied territory” from the report of the African Commission on Human and Peoples’ Rights and from the Summit resolution on the Sahara. The wording of this resolution and the AU Commission’s call for a consensual solution to the Sahara conflict are certainly not to the taste of the leaders of Algiers and their protégés, the Polisario, who perceive there the beginning of a turnaround on the African chessboard in favor of Morocco.